When we met List Labs team in their office back in August and told them they have been cited by more than 10,000 scientific publications, they are both delighted and surprised. I am familiar with this reaction. Most biotech companies do not know how many times they have been cited, and they often lack the time and expertise to track their citations in a timely and comprehensive manner. For example, BioChain Institute‘s own team only found 40% of what we can find, and after verifying our data, they are happy to free themselves from this tedious job by letting us handle their citations. 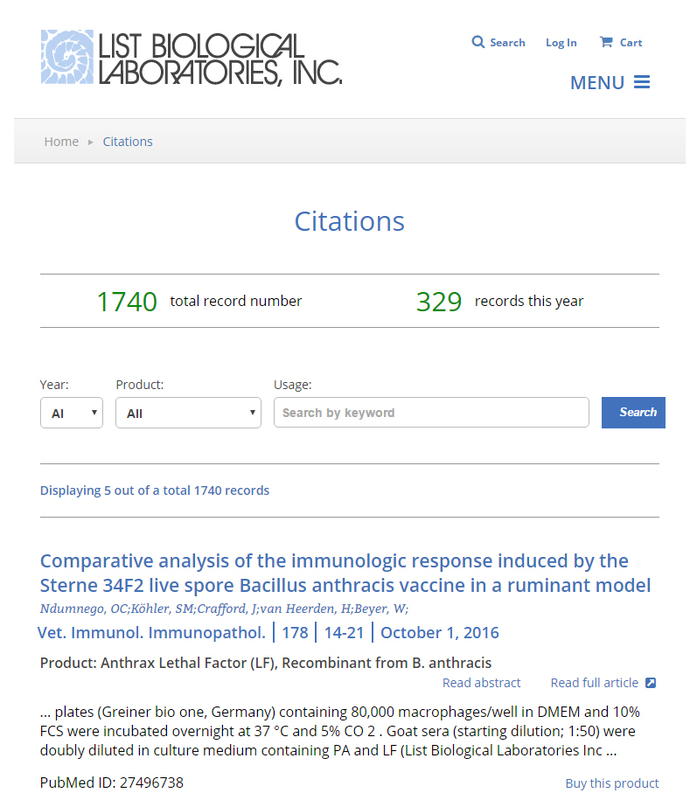 We delivered List Labs’ citations in about a week. It is an Excel sheet with many detailed information about the publications, including title, authors, journal (and its impact factor), volume, PubMed ID, email address of the authors, and many more. In addition, List Labs provided us a list of 1,120 keywords, some of which are their product names and catalog numbers (e.g. Ultra Pure LPS from Escherichia coli O111:B4). We matched each of the 1,120 keywords to each of the citation, and put the matched keywords in a column in the data sheet we sent to List Labs. At that time I was wondering how List Labs would use the data. Two months later, they told us that their citation webpage is ready. I am immediately impressed. Firstly, they put the number of citations in big font. This will quickly convey a message to the potential customers: we are credible. Secondly, the webpage is interactive and their visitors can easily search. You may choose which product’s citations to show. This is truly helpful for those who want to get reference before making the purchasing decision. Lastly and most importantly, do you see the “Buy this product” link after each citation? List Labs matched each citation to a specific product using the matched keywords. This small link seamlessly directs the visitors to the product’s purchase page.